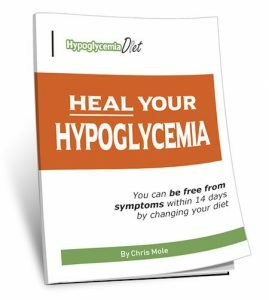 “I have suffered for many years with hypoglycemia symptoms. But this past year I suffered from a breakdown of my health brought on by high physical and emotional stress. I have not been able to fully recover and still find myself having to eat every hour or more often to keep my sugar from dipping into the 60 or low 70s. I feel awful if I don’t eat, brain fog, poor memory,confusion, dizzy, syncope, and severe stomach cramps. I have food allergies that limit my diet. Anaphylaxis was the symptoms that brought us to an allergist to begin with, but I avoid those foods. I’m a health nerd and have extensively studied diet and nutrition. Love to exercize but can’t do much anymore or my sugar stays low in spite of all I eat. I’m sorry to hear of your health problems. It’s difficult to give advice without more information. However, I am cautious about food allergies because they can lead to a limited diet, which is not good for your health in the long run. That was certainly my experience. I went down the food allergy track for about 3 years before realising it was making me worse. My advice is to forget about food allergies. Eat the foods that you enjoy. Don’t eliminate anything unless you get a violent negative reaction after eating it. As a starting point, I would eliminate refined sugar and ideally caffeine too. 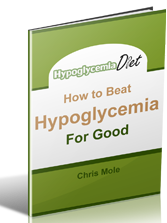 Sugar and caffeine are the two main things behind hypoglycaemia. If you are consuming either of those in any quantity, that’s where I would start. Beyond that, eat a balanced diet of the foods you enjoy. That’s what worked for me. One of the problems is that we read and research so much, we can get frightened to eat anything. This creates nutritional deficiencies, which make your health worse in the long run. I remember when I started eating dairy products again after 3 years being dairy free (and gluten free and a whole lot of other foods I was avoiding due to supposed allergies). I was really afraid the first time I drank a glass of warm milk with hot chocolate. But the taste was heavenly and I felt great afterwards. If you have read my free report and my ebook, that will give you some diet guidelines. Just look out for refined sugar and also caffeine, which I don’t stress so much in my books but I personally feel can be just as bad (if not worse) than sugar.